Extensive fastener corrosion comparison testing and field use have proven that the future of coated fasteners lies with fluoropolymer coatings. Previously, hot dip galvanized, cadmium or zinc plated fasteners were considered the standard. But these coatings could not stand up to the corrosive atmospheres prevalent in many industries. 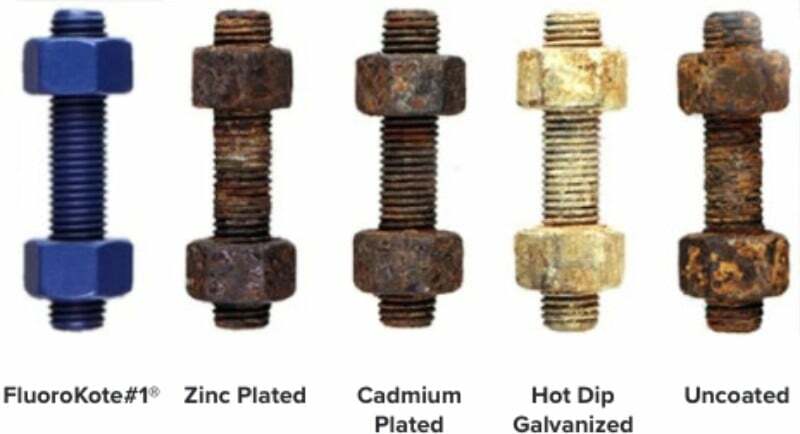 After 2,000 hours of salt spray testing (ASTM B117), fasteners coated with these conventional methods showed severe corrosion and, in some cases, failure. Fasteners coated with FluoroKote#1® fluoropolymer coating withstood these harsh conditions with no noticeable deterioration. Even after as many as 4,000 hours, FluoroKote#1® coated fasteners still could be easily disassembled.